The Atlanta Hawks will begin their inaugural Unity Weekend with a day of community service Friday and a ride on a float in the Atlanta Pride Festival on Sunday, and concluding with the first Unity Game on Monday against LeBron James and the Cleveland Cavaliers. With cultural, inclusion and social issues a hot topic these days in America, there may not be an NBA or professional team working harder to fit into today’s changing country than the Hawks. It took some embarrassing episodes, however, to get the team to this point. Ferry, now a special adviser to the New Orleans Pelicans, resigned from the Hawks in June 2015 after a 10-month leave of absence. Left to deal with the aftermath was Steve Koonin, who was named CEO of the Atlanta Hawks Basketball Club in April 2014. To make matters even worse for the team, the franchise’s controlling owner Bruce Levenson reported that he sent out a racist e-mail two months earlier criticizing what he viewed as the wrong predominantly African-American fan base for the Hawks in September 2014. The e-mail sent to Ferry detailed Levenson’s belief that the Hawks’ fan base was “overwhelmingly black” and the “black people scared away whites” from attending games. Levenson also wrote that the Hawks games were attended by a 70 percent black crowd with predominantly black cheerleaders, hip-hop music, 90 percent black patrons at the arena’s bars and fewer fathers and sons at the games. He added that concerts at the games were mostly hip-hop or gospel, thus attracting more African-American fans. Levenson sold his interest in the Hawks upon revealing his e-mail to the NBA. Koonin recalls being “shell-shocked” at the time. “I had no experience in ever dealing with something like that, but we were honest and transparent, which I think is the only way to deal with people. We worked our way through it,” Koonin told The Undefeated. Shaw said that not just blacks, but all of Atlanta was upset by this news. “Atlanta is the home of [the] civil rights [movement]. Atlanta is the birthplace of Dr. King. And Atlanta is known to drive conversations surrounding unity. When this happened to our NBA team and our city, the whole city was upset,” Shaw said. The Hawks posted a job listing for a chief diversity and inclusion officer on Oct. 7, 2014. After considering about 50 candidates, Koonin hired Shaw on Dec. 10, 2014. Shaw believed she was “well positioned” to aid the Hawks and was actually was a member of the Hawks’ crisis team after the incidents with Ferry and Levenson. 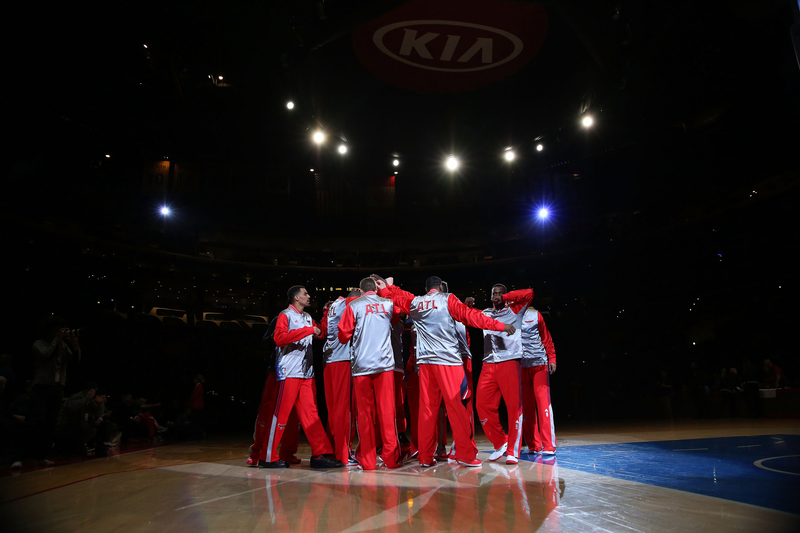 The Atlanta Hawks huddle together on the court before their NBA game against the Los Angeles Clippers at Staples Center on Jan. 5, 2015, in Los Angeles. Shaw was the first chief diversity and inclusion officer hired by an NBA team. She is responsible for developing and embedding diversity and inclusion best practices throughout the Hawks organization. As the former senior vice president of diversity & inclusion at Edelman, the world’s largest public relations agency, she designed a strategic, cross-departmental program that creates deeper cultural awareness and sensitivity. Moreover, Shaw provides guidance to the Hawks’ leadership team so that they can carry out inclusivity in every facet of the business. “I decided that this would be a very unique opportunity because for once the NBA could lead in this space and could turn a crisis into a triumph,” Shaw said. “We could take an ugly public situation and we could figure out ways to take actionable steps toward pushing the agenda of unity, of diversity, of inclusion. And we could then be a force of light for the rest of the NBA because none of the teams, at that time, had a chief diversity officer. On July 19, Shaw hosted an all-employee internal forum centering on what the Hawks described as “the unsettling and alarming events around the nation during the summer.” About 120 employees were divided into groups of three and challenged to come up with ways the company could unite Atlanta. Since it was during offseason, no Hawks players attended, but coaches and basketball front office members did. Community service, inclusion and using Hawks basketball to unite the city were among the ideas that came from what, at times, was a very emotional session. Koonin described the meetings as “incredible” as employees talked about their fears and hopes. He said the words of one young black male employee stood out to him. Koonin said management promised Hawks employees that action would come from the all-employee internal forum. And from it, Shaw spearheaded the concept of Unity Weekend. It begins Friday, when the Hawks’ organization will participate in an all-staff service day with six service projects in the city, accumulating 1,000 combined hours of community service. The Hawks participated in the Atlanta Pride Festival last year, but on Sunday they will have a float in the parade for the first time. Hawks players, employees and former players have been invited to ride on the float and throw 2,000 basketballs to the crowd with pride and Hawks logos on them. Unity Day concludes with the first NBA Unity Game on Monday, with the Hawks hosting the 2016 league champion Cavaliers. Among the things making the Unity Game unique is that players from the Cavaliers and Hawks will intermix during pregame warm-ups for the first time in NBA history. Koonin said that Hawks vice president of public relations Garin Narain, a former Cavs employee, called the Cavaliers to see if they were interested in participating during the offseason. Cavaliers general manager David Griffin immediately said yes to the preseason event. “[Narain] made one call and they said, ‘We’re in,’ ” Koonin said. There will be a singing of the national anthem from the Atlanta Gay Men’s Chorus. The Hawks and Cavaliers players have filmed videos airing during the game explaining what unity means to them and how the next generation can positively impact their cities. National Center for Civil and Human Rights CEO Derreck Kayongo will address the crowd and speak on the topics of unity, inclusion and social harmony at halftime. The Hawks will also announce financial donations from the Atlanta Hawks Foundation to the National Center for Civil and Human Rights and other organizations “embodying and delivering messages of respect, tolerance and peace through their work.” ESPN will also unveil a traveling sports exhibit called “Breaking Barriers” that will be at Philips Arena for 30 days. Koonin is very excited about the arrival of Unity Weekend for the Hawks and says there was some good that came out of all the bad.